Did you know that today is Tartan Day in Canada? Neither did I until I got an email last week from Adam Grant at The Monks Table, a great pub and restaurant in midtown Toronto, announcing that April 6th is officially recognized as Tartan Day – a day to celebrate Canada’s Scottish/Celtic heritage – and that he’d be holding a week of events at the pub to mark the occassion. And with some Googling, I found a bit more about it. 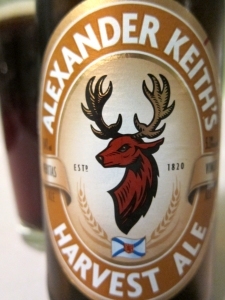 Unfortunately, my schedule this week is making it unlikely that I’ll be able to make it up for any of the events, so as a consolation prize, I toasted the day with a bottle of Alexander Keith’s Tartan Ale, the latest in the Keith’s Brewmaster Series of limited edition brews. Some may remember my joking complaint a few weeks back about not receiving a press sample of this beer when every other beer blogger in town got one, and thanks to the magic/creepiness of the Internet, a rep from the PR company contacted me the next day to apologetically rectify the situation. My comment wasn’t intended to be bait for a freebee – I was being more self-depreciating than self-promoting – but I did want to give it a try, so I accepted the offer. And of course, given the large number of opinions that have already been offered , it’s hard to say much that hasn’t already been said, especially since my impressions are similar to many already expressed. To wit: Pouring a deep and clear reddish-gold with a large white head, it has a respectable appearance, and an equally respectable – if somewhat muted – aroma of sweet caramel and barley candy. The caramel predominates the flavour as well, with supporting notes of maple and orange, and a suggestion of peat smoke that builds a bit as the beer warms. The finish is short, but noticeably hopped, leaving a final impression of a beer that is a well made step-up from most of the Keith’s/Labatt line-up, but which isn’t really interesting enough to inspire me to purchase or open another. Way, way back in the days when the number of Canadian beer bloggers could be counted on one hand, it was pretty easy to write about a new (or even old) beer with some confidence that you’d be the only person doing so. Nowadays, though, there are so many of us – and so many breweries and PR companies sending samples to most of us – that my RSS feed of Canuck beer blogs can be a bit of an echo chamber at times. 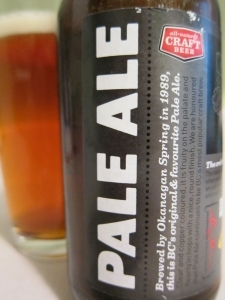 Case in point: A couple of weeks ago, a bunch of us in Ontario were sent six-packs of Okanagan Spring Pale Ale, a BC beer that has been available on tap here for a couple of years, but is new to the LCBO. I’ve made a point to try and avoid reading the reviews that have followed in hopes of giving an untainted opinion, so I’ll be curious to go back and see what the rest of the guys thought. First, I don’t often mention packaging when writing up reviews, but I have to compliment whoever designed the branding for this beer. The label is particularly nice, with striking iconography and a unique layout that has text and graphics going every which way without looking too busy or cluttered. With such an impressive introduction, it’s just too bad that the beer itself isn’t nearly as inspired or innovative. That’s not to say that there’s anything particularly wrong with it: from its bright copper colour , to its clean aroma and flavour that bring together notes of toasted grain, fruity malt and cut-grass hops, to its soft and crisp mouthfeel, it’s a perfectly pleasant beer. I had no problem drinking all six, with a few of them accompanying meals such as pizza and roti and doing a decent job of it. What they didn’t do, however, was leave any sort of impression behind. While drinking, I’d think “yeah, this beer is all right” – and a few minutes after finishing, I’d barely remember what it looked, smelled or tasted like. Even now, just moments after polishing off the last bottle, I’m already having a hard time recalling anything about it that would make me want another. And needless to say, that isn’t a good state to leave a beer drinker in when you’re hoping to get them to buy more of your product. If you know whisky, you’re probably aware of the stir that Compass Box and its founder/whiskymaker John Glaser has caused in the whisky world in the last decade or so. Even as a casual whisky drinker, I’ve been aware of the cult-like status that Glaser has developed for his products, as well as the controversy that some of them have caused. (Google “John Glaser” and “Scotch Whisky Association” together to get a taste of the latter.) In simple terms, Glaser obtains whiskies from various distilleries, combines them, and then matures the blends in different woods to create artisanal blended whiskies that are ranked as high as premium single malts by many aficionados. Spice Tree is one of Glaser’s Signature Series whiskies, and the appropriateness of the name comes clear from the moment it’s poured, as big notes of clove and ginger come forward, with supporting notes of cinnamon, vanilla and orange peel. Ginger dominates the palate as well, with toasted oak, vanilla and cinnamon behind, along with a developing hint of nutmeg, and a whiff of wood smoke. Just as the whiskies of Compass Box are considered unorthodox, so too can Gouden Carolus Hopsinjoor be looked at as a bit of an oddity, and a product of a modern and experimental beer culture. For years, the ales of Belgium have been known to emphasize aromas and flavours produced primarily by malt and yeast, with hops playing a backing role. But more recently, as the hops-forward beers favoured by many American breweries have started filtering back to the Old World, some brewers there have been cutting loose and beefing up the hops in their recipes. Hopsinjoor is one of those beers, brewed using four strains of hops, each added at a different point in the brewing process to bring out their aromas and flavours to full effect. It pours a beautiful golden colour with a vague haze and a huge cap of rocky white foam. Forcing their way through the head are rich aromas of peppery yeast, fruits like pineapple and orange, some lemon zest, and a slightly medicinal pine-like note. The body is quite active, giving a crisp and effervescent mouthfeel that cleanses the palate and lets the hops shine through in the flavour, with notes of grapefruit, pine sap and cut grass, along with hints of banana and pineapple, and a bit of pepper in the finish. 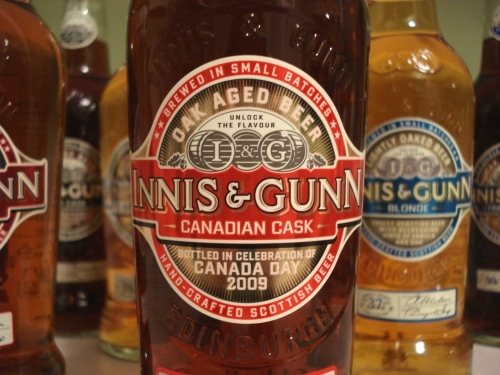 Each weekday this week, I’ll be posting a pair of mini-reviews covering selections from the latest additions to the LCBO’s Whisky Shop premium whisky program, and the products in the LCBO’s Spring 2011 Specialty Beer promotion. Today’s picks are a blended whisky that surprises, and a hotly anticipated beer that lives up to the hype. At first glance, including a less-than-$40 blended whisky in a line-up that features primarily higher-end single malts seems like an odd move on the part of the LCBO. But just as the standard Famous Grouse is one of the best entry-level blended Scotches available, the Gold Reserve is a fantastic mid-level blend that rivals some single malts in complexity and quality. 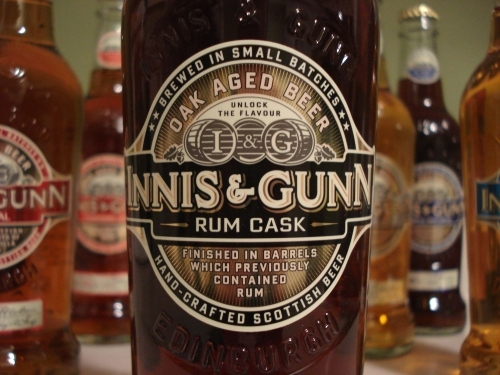 It offers a nice balance of flavours, with fruit (especially apricot) and spice off the top, peated grain and sherry wood in the middle, and smooth caramel notes in the finish. A really great whisky, and an amazing value. As one of the first American-style Double IPAs to ever be widely available in Ontario, the anticipation among Ontario beer geeks for the arrival of this beer was such that it’s been selling out almost instantly as it hits the shelves, which means it might be hard to track down. But if you do manage to get a bottle, you won’t be disappointed – assuming you’re looking for some red-hot hop action, of course. Reddish copper with a thick and creamy off-white head, it throws off a delicious aroma of pine resin and candied citrus peel, with caramel malt notes playing second banana. In the flavour, the malt comes forward a bit more, giving some balance to the big hops that sing out with pine, spruce and grapefruit. The full body gets a little syrupy as it warms, but not to the point of being cloying. Fantastic stuff, and if you want to see how it stacks up against a great Double IPA from south of the border, grab some Southern Tier Gemini (LCBO 211425 – $9.00/650 mL bottle) which is also part of the Spring release. 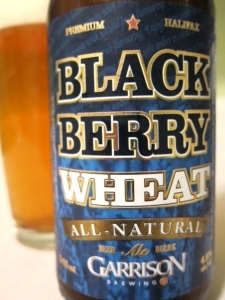 Garrison Blackberry Wheat isn’t exactly the most seasonal beer to be drinking on a cool evening in March – quite literally out-of-season, in fact, as it’s only available from the brewery in May through September, and this bottle was sent along with a few other east coast brews as an Xmas present by my brother-in-law in Halifax. So I can’t even be sure exactly when it was brewed and bottled, aside from knowing that it’s at least six months old. Not promising, especially for a 4.6% abv beer. It still seems to be in good shape, though, with an inviting aroma of slightly tart blackberries and toasted grain malt coming off of the golden body and large white head. It’s light and crisp on the tongue, and malt and berry notes come together in the flavour to evoke something close to blackberry pie, with a hint of orange and herbs joining in the subtly hopped finish. Definitely one of the better non-lambic fruit beers I’ve tried, and hopefully I can convince my bro-in-law to send me a few in the summer when they’re even fresher and more suited to the weather. My biggest weakness as a blogger has always been my habit of writing so-called “blessays” – i.e. long posts that take a lot more time to write than I usually have to spare. The result has been a blog that is often neglected for days or weeks at a time, while the backlog of things I want to write about – and beers that I intend to review – keeps getting bigger and bigger. My initial impressions of this beer are good – it pours a really gorgeous mahogany colour with a thin tan cap, and the aroma is appealing, with notes of caramel and cherry candy (I almost wrote “cherry cough drops,” but it’s not quite so medicinal). The body could do with a bit more heft, but it’s still adequate to carry the flavour, which follows on the aroma with some caramel and dark cherry, joined by a faint nuttiness, a suggestion of cocoa, and a moderate bitterness in the finish that doesn’t quite balance the sweetness, but comes pretty close. In the end, it’s undeniably a fairly mainstream product, with the aromas and flavours being more restrained than they might be in a similar beer from a small craft brewery. 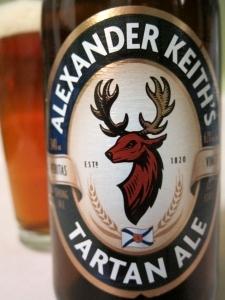 But for a brewery the size of Keith’s/Labatt, it was an admirable and generally successful experiment, and one that has me really curious to try the Tartan Ale. While my “Beer of the Week” column on Taste T.O. usually features positive reviews of beers that I like – or occasionally, so-so reviews of beers that I can at least appreciate to some degree even if I don’t love them – it’s rare that I post a completely negative review. 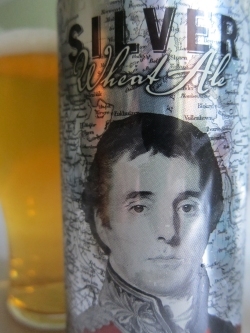 But that’s what you’ll find there this week, as I have nothing good to say about Wellington Silver Wheat Ale, a complete mess of a beer that is made even worse by the fact that it was made to celebrate Wellington Brewery‘s 25th anniversary. Most breweries take such milestones as an opportunity to create something really big and special and flavourful, but Wellington decided instead to go in the opposite direction, releasing a pale and light North American style wheat ale – and one afflicted with a multitude of flaws to boot. Click here to share my pain, anger and disappointment. My weekly column for Taste T.O. 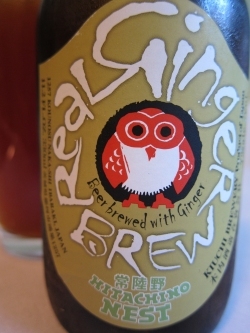 went up a little while ago, featuring a review of Hitachino Nest Real Ginger Brew. As the review notes, I nearly gave up on this beer after having two pretty awful samples a couple of months ago. But good buzz about it once it showed up as a late arrival in the LCBO’s Summer seasonal beer release convinced me to give it another shot, and I had a much more positive experience.